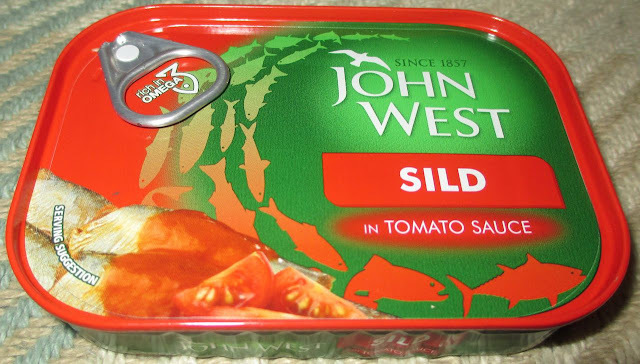 I hadn’t heard of Sild in Tomato Sauce until I picked up a tin of it by John West in the local supermarket. Typing up this review I don’t feel particularly foolish anymore, because my spell checker hadn’t heard of Sild either! If the word wasn’t on the can, I’d be freaking out a little by now… although I am still freaking out! How can I have not of heard of a tinned fish? Okay so there’s tinned Sardines, Pilchards, Eel, Tuna, Salmon, Anchovies, Mackerel, Kippers and lots of others I can’t think of right now, but I’m bound to have tasted them at some point. Sild? Looking it up and I clearly have no idea about fish. Sild is a young Herring, usually processed as Sardines, but called Sild if they are canned in Scandinavia… It’s wondrous what you can pick up and forget soon afterwards on the Internet. Anyway, on opening the tin there was quite a battle not to get covered with fishy tomato sauce. I have to admit I failed embarrassing and had a slurpy unattractive bath in the red fishy fluid oozing out of the tin. I managed to flick a certain amount of it in various directions on finally peeling off the lid. I’d recommend you open a tin of this in the kitchen sink with an apron on if you value your clothes (or open it naked if that suits you) or you could open it outside (and not naked unless picnicking in a naturist area) and don’t open it too close to Seagulls. The fish had a usual fantastic melt in the mouth John West Sardines in tomato sauce type flavour, not salty, not sweet, but a little oily and having a rich tomato sauce with it. Again be careful whilst eating the Sild. Picking up bits of fish from the tin and on the way to my mouth it was occasionally falling to bits and splashing me with more oily tomato fishy sauce. This is not an attractive meal. Eat carefully, with the plate or tin close to your mouth (or eat naked if it suits you or you’re in a natur… oh, you get the idea!). 110g tin, with 198 calories per 100g, with 15.3g of fat, 1.9g of sugar, and 1.2g of salt. Ingredients included; Sild, concentrated tomato puree, water, sunflower oil, sugar, salt, waxy maize starch, and spirit vinegar.